Your Plumeria plant needs well-draining soil, full or partial sun and regular water. From what we can see in this photo, it did suffer from frost damage. 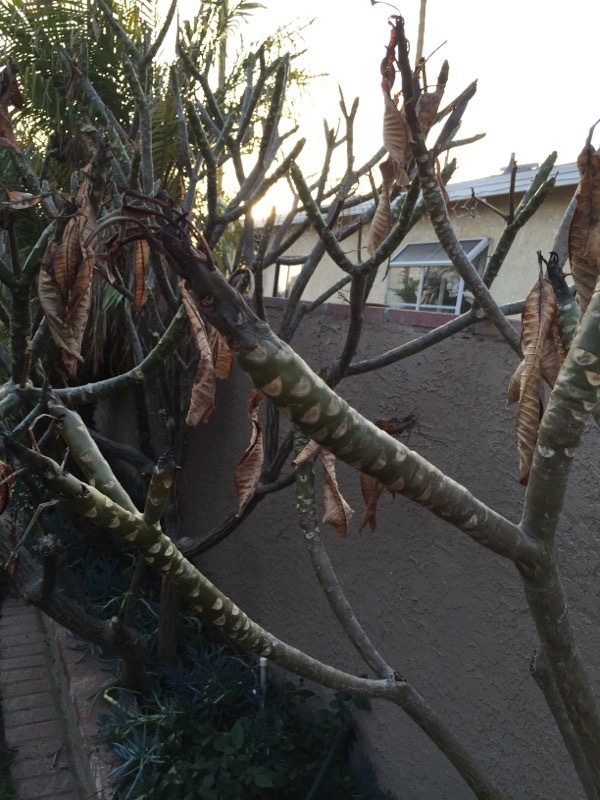 However, this is also the time of year that Plumeria go dormant and shed their leaves. Cut back on water but do not allow soil to dry out completely and protect from future evenings of frost by spraying with an antitranspirant or covering with a horticultural blanket. Do not prune off damaged portion until new leaves emerge and you can see exactly where the damaged portions extend. Also, protect the roots from frost damage by applying a 3 inch layer of mulch around the plant, leaving about a 2-4 inch diameter clearance, away from the base of the plant. We hope you can save your plant. 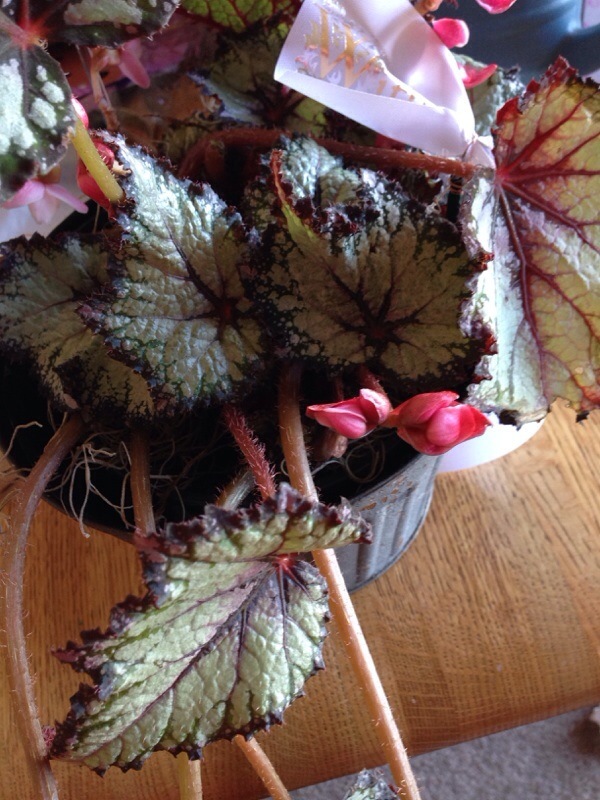 This is a Begonia species. 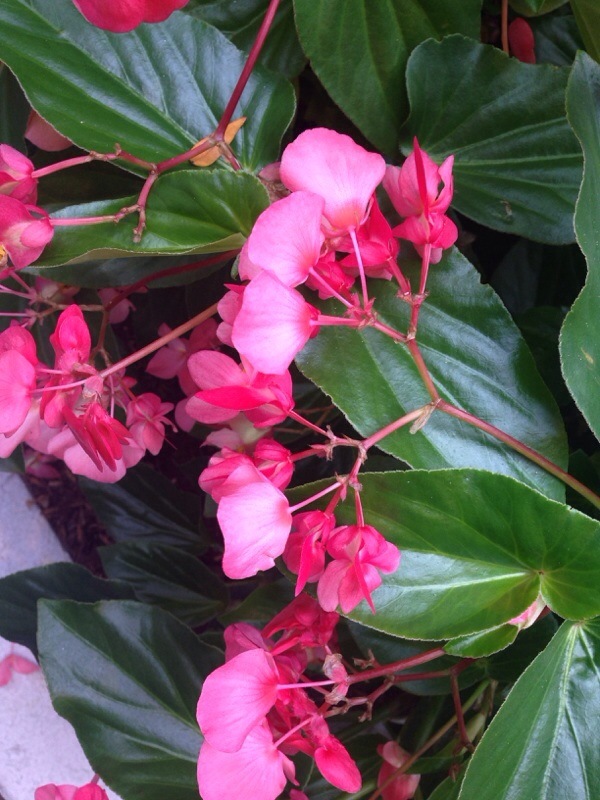 Begonia are native to South America and are tropical plants requiring good moisture and frost free conditions. 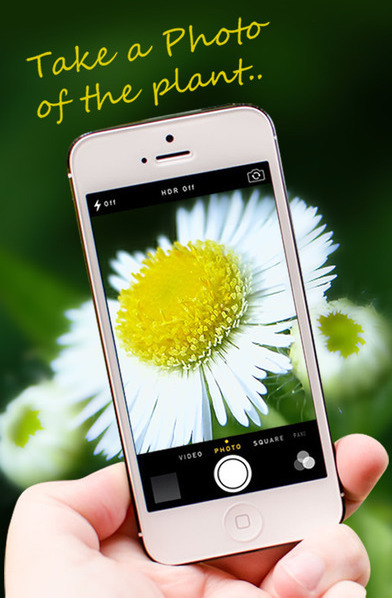 They are used extensively world wide as house plants and as bedding plants and also as perennial garden plants in tropical or nearly frost free areas. Thousands of hybrids are produced and available. They come in many shapes and colors. Since there are so many different ones available, and they change varieties from year to year, we can only make an educated guess with this. It may be part of the new Non-Stop Series from Proven Winners. Sorry, but that is the best we can do. If you know where it was purchased, you can ask someone in the annuals department, to tell you which "brands" they carried this year. Tillandsias can live where few other plants can because in nature they live perched on branches and rocks and need no soil. 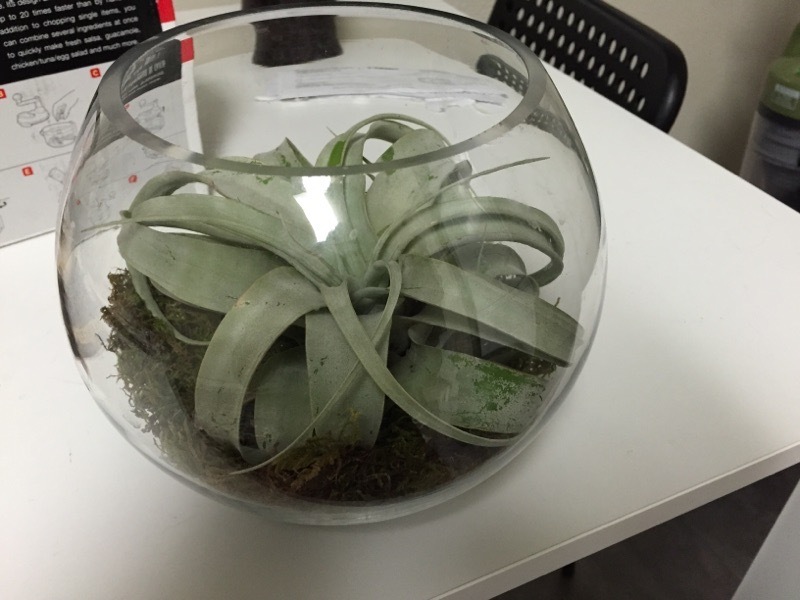 Their soil-less habit is why they are called air plants. T. xerographica is native to Mexico, El Salvador, Guatemala, and Honduras. A majestically slow growing plant with silvery gray leaves that are wide at the base, then taper to curly points. Soak the entire plant in a bowl or bucket once every 5-7 days. Rain, pond or fish tank water is best, but if these are not available use bottled water. Chlorinated tap water can cause problems over time. Tip it upside down, give a shake to get water out of center and let it dry bottom end up. This will insure that no water is trapped, which causes rot. Does best in full sun to very bright light. 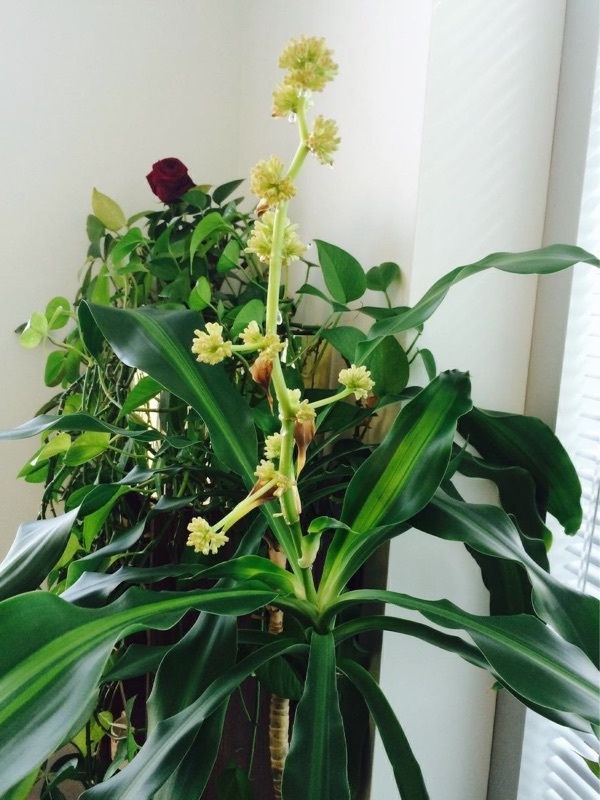 Your plant is likely a species of Dracaena that is in flower. It is popular as a house plant or outdoors where winters are mild. As a house plant it needs bright indirect light, regular water and feed with a slow-release fertilizer formulated for container plants. Do not allow plant to sit in water as this may lead to root rot as well as browning leaf tips. Water in the sink or shower if possible and allow the water to drain out completely. Water only when the soil feels dry down to the first knuckle. If leaf tips turn brown, your tap water may have too many salts in the water so switch to steam iron water. Most houseplants are endemic to the tropics and are sensitive to salts in the water or quick release chemical fertilizers. 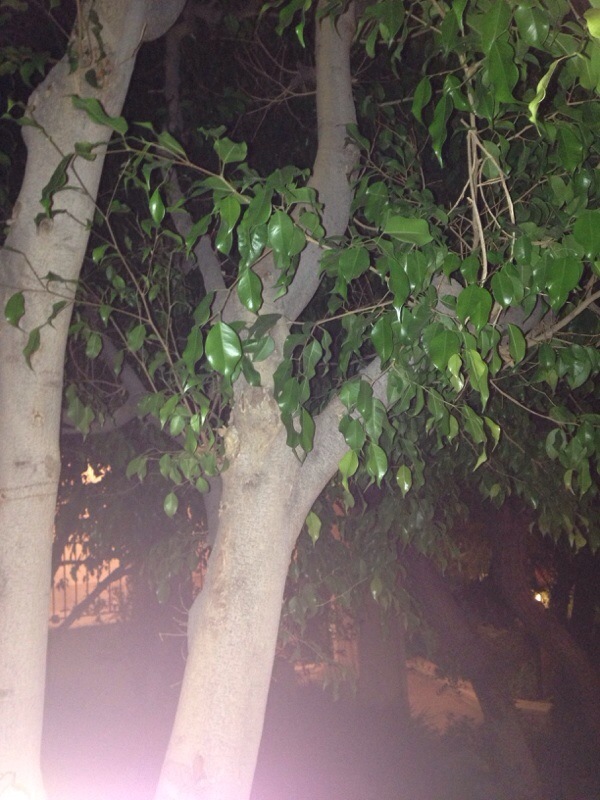 Your plant appears to be a Ficus benjamina, a member of the large fig family. If we're correct, when a leaf is broken off, a milky latex will exude. Ficus like bright, indirect light, moist (but not soggy) soil, and a permanent location. When their pot is moved, they often respond by dropping all their leaves. 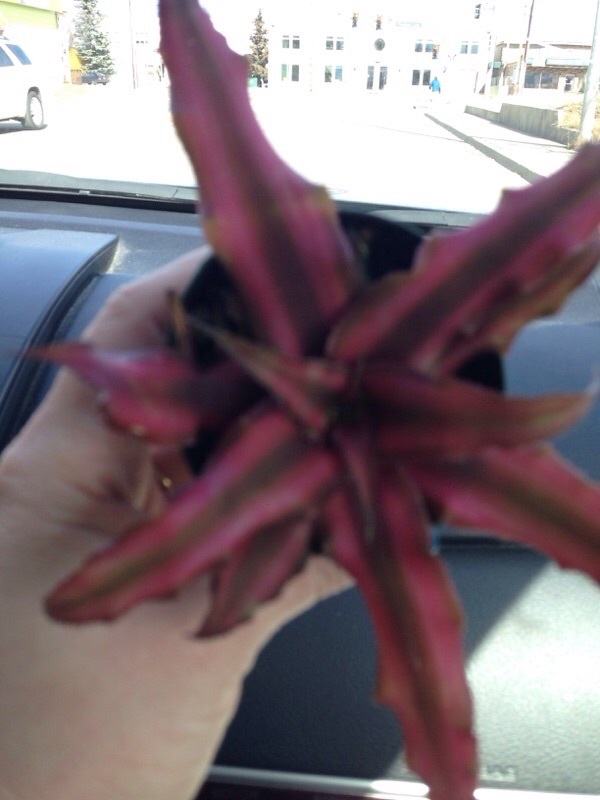 Thankfully, these usually grow back.The container needs to be well draining and do not allow plant to sit in water as this may lead to root rot. In some climates the tree does well planted in the ground. From this photo we cannot tell for sure if this is a F. benjamina. If you disagree, please take a few clippings to a horticulturist at your local garden center to see if they can identify the plant and the problem for you in hand. 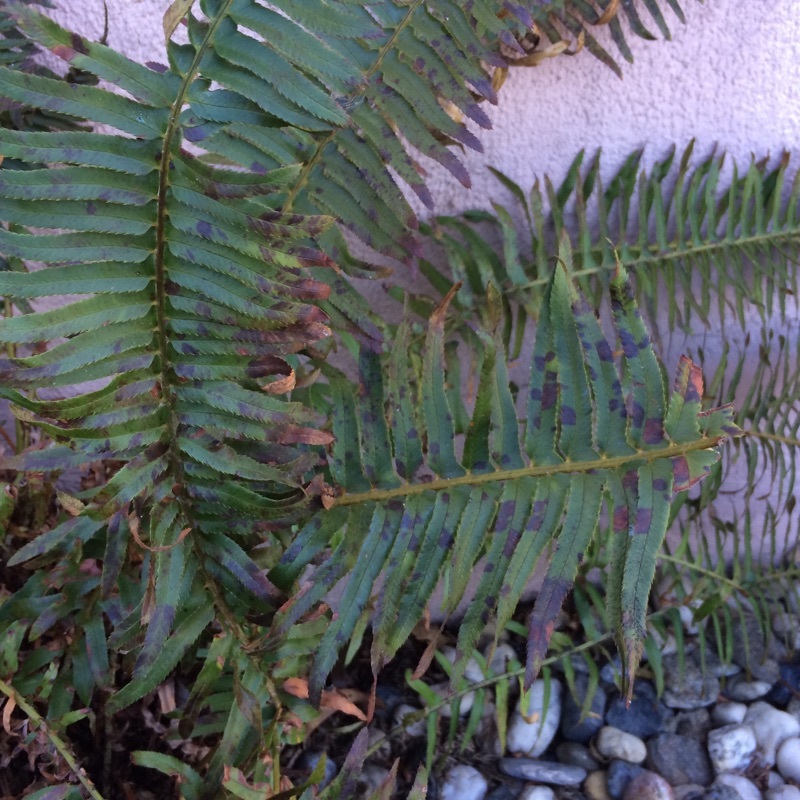 The spots on your fern could be either a bacterial or fungal disease. It is close to impossible to give a definitive answer on diseases without proper lab testing. 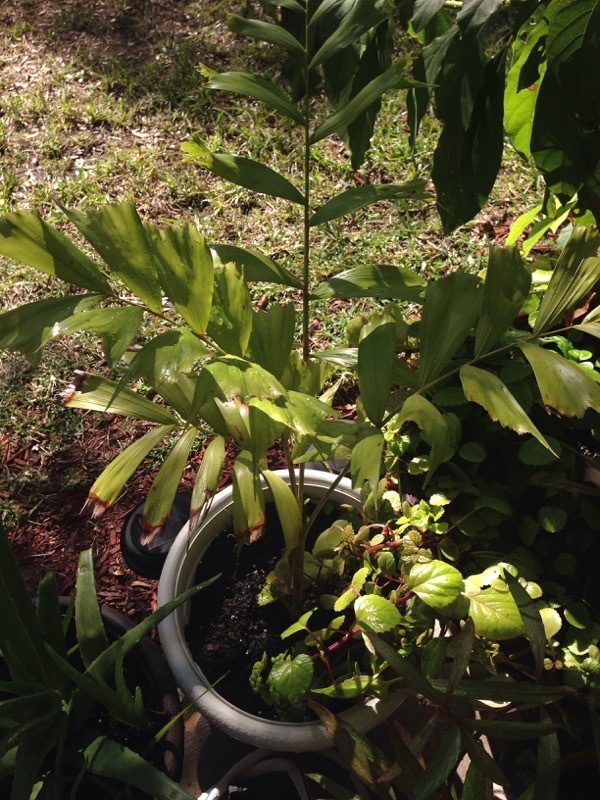 Is it possible that it is being kept too wet (we know, hard for a fern) and is not getting enough air circulation? You might want to seriously consider removing and properly disposing (do not compost) of affected plant parts and review your watering practices. Try watering the soil beneath the plant rather than overhead as that splashes and spreads the disease. You might also want to take a bagged sample of affected plant parts to your local independent garden center for a more definitive answer and possible suggestions for a solution based on your particular situation. Beehive Ginger is an ornamental ginger native of Thailand and produces spectacular cones of flowering bracts that begin a greenish color and eventually age to a bright golden yellow, pink or red. Cones can be large, up to 20-30cm tall. 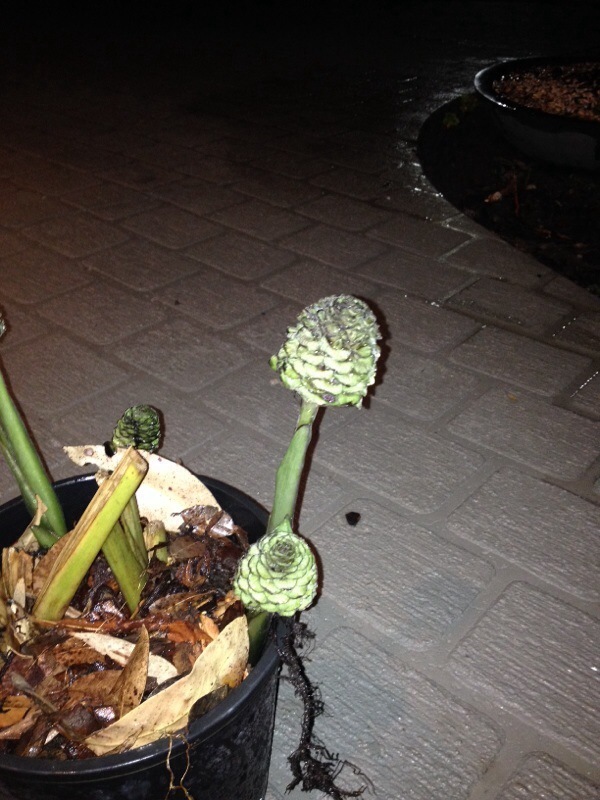 The cones grow on a short spike from the base of the plant. In tropical areas the plant will grow all year around but in cooler climates goes dormant in winter. Plant in part shade, soil should be well drained and moist. This ginger will grow well in full sun as well in the subtropics and tropics, but foliage will be a lighter green and some sunburn might occur during very hot weather. Does not tolerate frost. In Australia it will grow as far south as Sydney. This makes an excellent, long lasting cut flower.